Out of Tor.com’s big lineup of releases for this summer, City of Wolves was one that immediately caught my eye and I’m glad I got a chance to read it. New author Willow Palecek has written an outstandingly well-developed and complete tale in a brisk 100 pages or so, while still managing to leave me salivating for more. I’ve always had a penchant for paranormal Victorian mysteries and detective stories; throw in werewolves too, and I am totally game. The story’s protagonist is Alexander Drake, an investigator-for-hire in the bustling Victorian London-esque city of Lupenwald. A former soldier who fought on the losing side for a deposed king, Drake now prefers to stay under the radar, taking on modest opportunities while staying away from jobs offered by the nobility even though they often pay a lot better. He’s forced to reconsider that position, however, when he finds himself ambushed one evening by Lord Colin Abergreen’s hired goons. Cornering Drake in an alleyway and dangling a large purse as an incentive, the nobleman makes our detective an offer he can’t refuse. I’m impressed with all that Palecek was able to pack into this very slim volume, which features well-crafted characters and a fast-paced plot. Hardly any words are wasted here, as in, blink and you might miss something. There are both positives and negatives to this, of course. 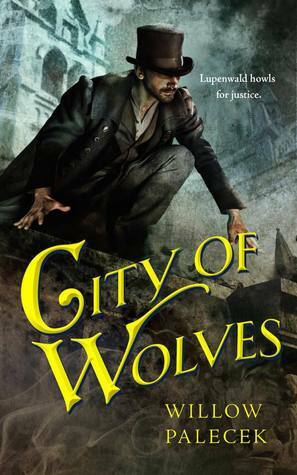 City of Wolves feels very much like other paranormal mysteries of its type, except it accomplishes everything in one third the number of pages. The story is very streamlined, with hardly an ounce of fat on it. The mystery takes off at a fast clip and never falters, and I liked that there was never a dull moment. Still, just because the plot is so efficient, doesn’t mean things aren’t tough for our detective. There are plenty of suspects to consider, and just as many scenarios to ponder in the face of perplexing clues and unexpected twists. There are even a couple scenes of thrilling action and chase sequences to shake things up. As for the downsides, the world-building feels a bit lean, admittedly. Drake zips from one place to another, and aside from a few cursory observations about his surroundings, we don’t get to see much of the city, and I feel like I’ve been robbed of the opportunity to experience Lupenwald in all its glory. I also failed to get a sense of atmosphere from the writing, which to me is such an important aspect of Victorian-era style fiction. Furthermore, Drake identifies himself as a Loyalist, something that’s clearly significant to his character and goes back to the War of the Wolves, a fight for the throne between two would-be kings. The book doesn’t dwell much on the conflict, but what little background was revealed about it was very intriguing. If the story could have been a little longer, I would have liked to see more of Lupenwald’s sights and sounds and for the narrative to fill in more of the world’s history—especially since the war was so obviously a defining event for our main protagonist. Needless to say, I would love for there to be a sequel. I wouldn’t hesitate to read another Alexander Drake novella, especially if future installments will be as enjoyable as this one. City of Wolves was a quick, entertaining read and what I saw definitely left me wanting more. Great review. This is definitely a story that could have been full length I felt. It is very streamlined and certainly hasn’t got an ounce of fat – like you said – but I absolutely wanted more. The author does a brilliant job with the time she uses but I definitely felt the lack of atmosphere – I wanted to experience that gothic creepy, dark alley, footsteps in the fog Victorian-esqu style coming through! As it is I don’t think the author had a chance to fit that in. I really liked this though and I’m seriously hoping that this was just a taster to see how readers liked it with a view to then releasing something more? Glad you enjoyed it. I wasn’t quite as satisfied with it, but I do believe if the story had been longer many of my dislikes would have been nullified. I can see that. I really liked it, but can concede that the story’s pretty lean. I was left wanting more as well. Nice to see a well paced novella! Sometimes that’s hard to achieve with such a low page count. I’m eager to read more werewolf stories, especially after reading the Devourers. Hopefully I can find time to squeeze this in. Ooh, I didn’t know The Devourers is a werewolf story. Another reason to look forward to it! Probably a good idea, but if you do decide to check it out, it’s really quick! The cover of this one snags my attention a lot. I’m pretty tempted to check it out since I’m all about paranormal mysteries that include werewolves. It’s a short commitment too. I’ll have try to find it at my library. Yes, very short! Perfect for a nice afternoon in, you could finish it in one setting. If you like a bite sized Victorian-esque paranormal mystery, this is it.